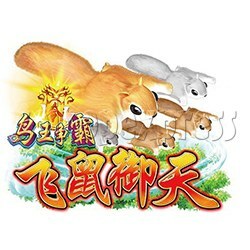 The Flying Squirrels Chinese Edition Arcade hunter game uses a high-definition screen design, support 4 players, 6 players , 8 players, 10 players cabinet for option. Bird King: After killing the bird king, the same kind of birds in the picture are killed together. Fire bird: The free shot has a penetrating effect and can attack the birds on the straight line. Rainbow Phoenix: Have the chance to get a random drop of feathers, you can get a higher prize. Golden Eggs: Collect the feathers of five rainbow phoenixes and start to lay golden eggs. Flying Mouse Order: Use the token to summon the flock of birds on the assault field. kit includes main board, IO board, key controller, power cable.